Harvest…it’s a wonderful, exhausting time and each harvest brings unique memories. I remember working one harvest in Sonoma. I had an opportunity to work for Elizabeth Vianna, winemaker at Chimney Rock…she can make an amazing Elevage! The work was hard, but intensely rewarding. That harvest I stayed with friends in Sonoma. Every day ended with the same ritual…I would get off work around 6-7 pm, exhausted, and point my car to their house. They would greet me at the door, Advil in one hand and a glass of wine in the other…what awesome friends! Each evening they pampered me with dinner, and twice a week they got me hooked on another ritual…twice a week, without fail, we settled in with a glass of wine (of course!) turned on the TV and we watched Dancing With The Stars…yep, I became a DWTS addict! I couldn’t help but think of those good times as I sat down this week to watch DWTS. It’s wonderful to have such great friends to share life’s moments with…we still share DWTS, except this time it’s while I’m sitting on my own sofa. Texting back and forth during the show isn’t the same, but it worked as we decided who we like best. 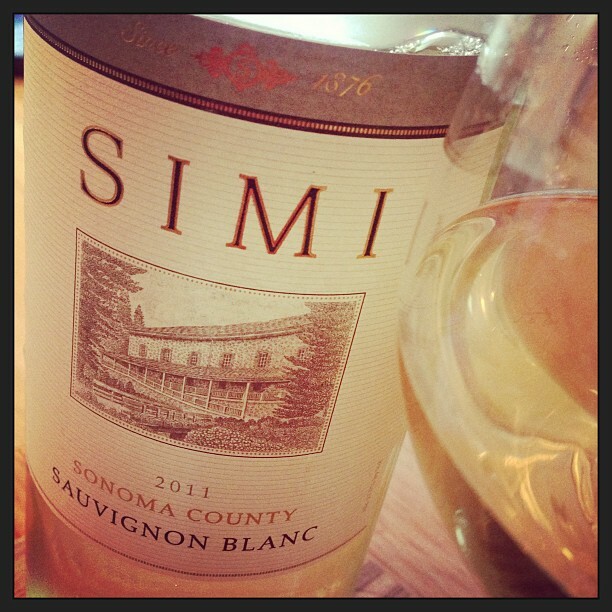 I decided to open a bottle of Simi 2011 Sonoma County Sauvignon Blanc to sip on while watching DWTS. I purchased this wine at my local grocery store for under $15. 13.5% alcohol by volume. As I sipped on it during the show, I thought this was an unusual Sauv Blanc. It tasted as if there was something else blended in it. I had to look it up online. Sure enough, there is 2% Semillon and 2% Viognier blended in. The 4% was enough for me to think that this was an unusual Sauv Blanc. I must admit, I liked it. It was very easy to drink. This wine had aromas of lemon, lime, apricot and slight peach with a hint of minerality (I love minerality on white wines.) On the palate I found a soft peach, lemon lime, and a hint of tropical fruit. The acidity was well-balanced with a long finish.